Readers Favourite Song. May You Never by John Martyn. It was a Friday night in 1976 and I was driving to a party in my mum’s Mini. Back then, we all listened to the pirate radio stations and every Sunday night, between 9pm and 11pm, Radio Caroline would play a listener’s personal Top 30. Suddenly, I heard a voice on the car radio say my name and announce that Radio Caroline would be playing my choice of 30 tracks the following Sunday night. I knew that John Martyn’s May You Never would be my No 1. His words contained a promise of protection, a guarantee of belonging somewhere – and to someone – for ever. That Sunday night, the Radio Caroline DJ Roger Matthews used my full name and announced my address on air with a liberality and a frequency that today would be considered irresponsible. I received fan mail and for a few giddy weeks, I was the coolest 17-year-old in Folkestone. Several years later, my friend Jonathan, who was head of entertainment at the London School of Economics, invited me to hear John Martyn perform live at the university. I went backstage to meet him before the show. He had had a lot to drink and I was disappointed that I couldn’t engage him enough to tell him how much his music meant to me, that I’d placed him ahead of Eric Clapton, Van Morrison and the Rolling Stones in my Radio Caroline Top 30. I saw him one last time at the Jazz Cafe in London in 2001. He had twice the weight on him and was in poor physical health but his music and his stage presence remained strong. In spite of relentless requests from the audience, he refused to play May You Never. He said he’d written a lot of good stuff since May You Never and he wasn’t going to play it any more. Ever. So we listened to his other good stuff, secretly hoping that he’d surprise us at the end, but he didn’t. A few weeks ago, my 24-year-old daughter was home for the weekend and I happened to be listening to Saturday Live’s Inheritance Tracks on Radio 4. She told me the song she would choose as her inheritance track would be May You Never, that she associated it with me and long car journeys when she was a child. I was touched and comforted to know that John Martyn’s music exists beyond time and place. Guilty pleasures? For women that’s most of our culture. One of the things I hate is the idea of “guilty pleasures” – especially about music. It is so blokey and always comes down to some guy liking something that is a vaguely different genre from the one he is associated with. I always remember Slash saying his guilty pleasure was Rihanna. What? Rihanna is a goddess. Also, no one is actually truthful. None of these people are blasting out Gary Glitter singles at a disco. How guilty is their pleasure, really? For women, much of culture is, in some shape or form, always guilty. Surprisingly, I don’t live in a separatist commune and much of what I like has been produced by men of dubious morality, to say the least. Separating the art from the artist is not only a subject of intellectual debate, but a physical reaction. When you hear James Brown, you want to dance. Sure, I would prefer great art to be made by people who adhere to my own personal belief system and who are kind to those around them. But I know this not to be the case. When the wonderful Tracey Thorn was on Desert Island Discs recently, she picked Solid Air by John Martyn. Superb. I would have trouble selecting just one John Martyn track. I used to love seeing him. I also know he was a violent, abusive man. Beverly Martyn, his wife, once wrote: “Over the years, I received a broken nose, a fractured inner ear and hairline fractures of the skull. One night, he smashed a chair over me and my arm was damaged when I put it up to protect my head from the force of the blow. He wouldn’t let me even call a doctor, let alone go to the hospital.” She said those around him knew what going on, could hear her screaming, but he was the great John Martyn, off his head on drugs and booze and yet able to write the most tender of love songs. I still listen to him. I still think William Burroughs, who shot his wife “accidentally”, is a brilliant writer, but I try to gauge my own reactions, and how they change over the years. Nick Cave writing about murdering women is somehow acceptable to me – but after the allegations against Woody Allen (which he denies) I can no longer watch his films. Hitchcock abused his female actors but I will watch his work, while Bernardo Bertolucci is unbearable to me now. Reading Lars von Trier’s latest interview made me question all this again. He is so messed up (so would I be if I had to grow up in rule-bound Denmark). He also faces allegations of sexual harassment (which he denies). But do I think he has made some brilliant films, as well as some execrable ones? Absolutely. Yes, I do. Walking this tightrope is simply what it means to have a politicised female sensibility. As much as I love Hannah Gadsby, I do not share her view that we should now dismiss Pablo Picasso because of how he treated women. Still, only the other day, I was flattered to be called a snowflake, as I thought that was reserved for young people. I first heard that term in Fight Club. Another great film … ? You see, the culture in which we immerse ourselves is a minefield of racism and misogyny. Learn from it. Don’t try to sanitise it … Can you love something that depicts hatred? Yes, sometimes you can and yes, sometimes this is the way that hatred is internalised. Fine lines. But the answer is not for women to refuse manmade art, it is instead to see that women too – from Paula Rego to Julia Davies to Elena Ferrante – can depict women who are as intriguing and complicated and as monstrous as men. Such women feel no guilt at all. The solution to art that is “problematic” is not to ban it, but to learn from it and make more art. Darkness is not the province of the masculine. Can you separate the life from art? Yes, and this is not an innate gendered quality. We do not need to feel guilty about our pleasures. Grace & Danger: A Celebration of John Martyn review – torrid tribute from Paul Weller and friends. Royal Concert Hall, Glasgow, 27 January 2019. A hard-drinking, kaleidoscopically voiced jazz-folk voyager who flattened both genre boundaries and those who got on his bad side, John Martyn died in 2009, aged just 60. To mark the 10th anniversary of his death, his musical and occasional boxing partner Danny Thompson has recruited eight guest artists for a Celtic Connections tribute show in the city Martyn called home. Thompson, looking resplendent in a kilt, remains spry at 79 and is still capable of wringing pure poetry out of a double-bass, as evidenced by his dreamy version of Solid Air, where he matches the roaming rumble of dapper US bluesman Eric Bibb with an equally exploratory bassline. The lush, spacey sound of mid-period Martyn is later recreated with the help of keyboardist Foster Paterson and bassist Alan Thomson – both also veterans of his touring band – alongside drummer Arran Ahmun and a swooning 15-piece string section. The results are suitably cosmic and, like the man himself, unpredictable. The animated Ross Wilson AKA Blue Rose Code whips up a gorgeous version of Fine Lines that inspires an audience singalong, while English guitarist Rory Butler dives into the cartwheeling instrumental A Day at the Sea with such rigour he springs off his stool. Lucy Rose’s heartbreaking solo Couldn’t Love You More is an early standout, while Eddi Reader brings both serenity and grit to Fairy Tale Lullaby, a deep pull from Martyn’s debut album and a song he apparently wrote when he was just 16. If the mood is freewheeling, Paul Weller initially seems all business, closing the first half with a raucous reading of Don’t Want to Know that highlights the song’s abrasive edges. But later he returns for a playfully insouciant version of Sweet Little Mystery alongside Rose that banishes any memories of the Wet Wet Wet cover. After a mob-handed, enjoyably chaotic rendition of May You Never with the house lights up, the gig closes with vintage footage of Martyn himself from 1986 performing a sweetly ravaged cover of Somewhere Over the Rainbow. After such a crammed evening of interpretation, it’s a potent reminder of the intimidating rawness of his talent, and leaves both the crowd and performers rapt. Remembering John Martyn ahead of the Celtic Connections tribute. I like them broken and shattered. Tattered and torn a bit” – John Martyn. Perhaps Martyn was always destined to be stuck between two personalities. He was born Iain David McGeachy in Surrey in 1948 to an English mother and a Scottish father. The pair were both opera singers but were to divorce when Martyn was five. He was brought up in Tantallon Road in Shawlands by his father. The pair were both opera singers but were to divorce when Martyn was five. He was brought up in Tantallon Road in Shawlands by his father and grandmother, although he would spend many summers in London with his mother. The young McGeachy grew up surrounded by two things that would shape his life – music and drink. His grandmother Janet was, according to Martyn’s biographer John Neil Munro, a pianist who was fond of a tipple and who introduced her grandson to whisky as a way to help him wake up for his milk round. By the time he was in his mid-teens McGeachy was drinking fortified wine on the streets around Queen’s Park, but he had also found a new obsession – the guitar. Inspired first by Joan Baez and then by Davey Graham, who was a key figure in the British folk revival of the 1960s, McGeachy was beginning his transition into John Martyn. Drawn into the Glasgow folk scene of the 60s, McGeachy came under the wing of luminaries such as Hamish Imlach and soon came to look the part of the handsome beatnik with his shaggy locks and piercing eyes. In late 1967 he took on the name he would become known by, when a friend suggested his own name sounded too Scottish. The rest, as they say, is history. Martyn is rightly renowned the world over for Solid Air, one of the finest albums of the 1970s, but it is perhaps the less well known but equally brilliant Grace And Danger that truly sums up Martyn’s split personality. It is a record of heartbreaking intensity, written during the period in which he was breaking up from Beverley, but its beauty is tempered by the rawness of the lyrics and the pain which is apparent throughout. Martyn’s marriage was imploding as a result of his lifestyle, the deep sadness within him that many of his friends have spoken of and the tragedies that afflicted those close to him, such as the subject of Solid Air, the English singer-songwriter Nick Drake who died after taking an overdose of anti-depressants in 1974. As Beverley – a singer-songwriter in her own right prior to her marriage to Martyn – explained it in 2004: “He had a life which I didn’t really know about. I had a child. I stayed in indoors. Martyn’s music was always autobiographical but on Grace And Danger some felt the emotion was too much to bear, and his Island Records chief Chris Blackwell desperately tried to delay its release as he felt it was upsetting. Prior to the recording of Grace and Danger Martyn had become close to Phil Collins, whose marriage was crumbling in a similar fashion to Martyn’s, and the pair would stay together at Collins’ home in Surrey and drink themselves into the stupor of the heartbroken. Collins would play on Grace And Danger and, while the record would never match the sales garnered by Collins’s own anatomy of divorce, Face Value, it was among the most polished and commercial of Martyn’s offerings. FOR long-time Martyn collaborator Danny Thompson, Grace And Danger was the natural title for the upcoming celebration of his old friend’s life to be staged during Celtic Connections. Double bass player Thompson more than most was aware of the contradictions in Martyn’s personality. The pair first came together on Road To Ruin, Martyn’s album with Beverley which came out in 1970. It was a meeting of musical minds. Thompson’s jazz background allowed him to follow Martyn’s often structureless approach to playing live and his appetite for drink made him one of the few who could keep up with his friend’s increasingly out-of-control bouts of boozing. Thompson had such an influence on Martyn that according to many friends, the Scot began to ape the mannerisms of the Londoner, with Ralph McTell telling Munro that Martyn “became Danny Thompson for a while”. As Martyn’s musical soulmate it is fitting that it was Thompson that should instigate the upcoming Celtic Connections tribute, which will take place on January 27 at the Royal Concert Hall. This month will mark 10 years since Martyn’s passing, yet his music remains as relevant and as popular as ever. It is no surprise that Thompson has managed to bring together a stellar lineup for the gig. Paul Weller, Martyn’s bass guitarist during his later years Alan Thomson, Kate Spencer, Ross Wilson, Rory Butler, Eddi Reader, a string section led by Greg Lawson and many more will join Thompson on stage to sing and play and pay tribute to one of Scotland’s own troubadours. Donald Shaw, creative producer for Celtic Connections, says: “John is a Scottish legend with his guitar style rooted in the folk stars of the 60s like Bert Jansch, Martin Carthy and Nick Drake. This concert falls 10 years almost to the day that John passed away. One of his last concerts was doing Solid Air at Celtic Connections. For Reader it is a privilege to be asked to celebrate someone who was such an influence on her as she took the first steps on her own musical pathway. “I loved John,” says Reader. “I knew of John as I was heavily involved in the folk scene of the late 1970s. When I became 18 and went to folk clubs for the first time it was that kind of scene that was the most vibrant and John Martyn was one of the kings of it. Reader was lucky enough to get to play with her hero on more than one occasion, but it was the initial meeting that made the most impact. “I met him after my own flurry with the charts [with Fairground Attraction’s Perfect],” recalls Reader. “We were doing the Transatlantic Sessions with Aly Bain and Phil Cunningham and John was there and he pulled me in and wanted me to sing He’s Got All The Whisky. “I remember his Gloria Love and the way he played it with that guitar tuning. And I really like that about his music – and in most folk music, particularly Scottish and Irish folk musicians. They have this real jazz eclecticism in their style and they can improvise at the drop of a hat. Martyn’s split personality was always in evidence, however. “He could tell I was a little nervous in his company and his voice would dance between Cockney and Glaswegian in company, but when he spoke to me he would be very Glaswegian and encourage me by saying ‘come on, hen’. Reader was lucky enough to see Thompson and Martyn’s relationship close up, albeit long after Thompson had given up on his hard-drinking lifestyle. There was, though, even then, many years after their heyday together, a symbiotic understanding between the pair. “They were certainly musically and personally aligned in lots of ways,” says Reader of the pairing. Reader also has a theory as to why so many musicians such as Martyn and Thompson give in to the temptations offered them. “Any musician that’s worth their salt, they take human beings with them,” says Reader. “It’s not about isolating yourself, it’s about being really competitive with yourself and finding that beautiful sound that makes you feel good. “That’s why musicians end up in trouble with their human frailties, predilections for drink and addiction. Anything that opens the door to that spectrum, musicians are like bees and honey. But you have to still do all the normal stuff like pay your taxes, and bring up your kids and take care of your wives or husbands. Martyn’s ability to weave magic with his music never really left him. Even in later years as he struggled with a succession of health problems brought about by his chaotic lifestyle he remained steadfast to the musical ideals of his youth. Even if his musical integrity was sometimes at odds with his personal integrity, Martyn never wavered from his ideals. “I’ll not be told what to do, I can’t do it in any shape or form,” Martyn said in 2004. “If you can’t play what you want to play then where on earth is your freedom? Martyn lost many things in his life – friends, his wife, a leg – but he always, despite the ravages brought on by addiction to booze and drugs, maintained his musical integrity. And, while he was never an easy man to understand given his complex personality, that is something to be celebrated. Grace & Danger: A Celebration of John Martyn is at the Royal Concert Hall on January 27. NOW a quarter of a century old and more popular than ever before, Celtic Connections puts the very best Scottish musicians on stage – and in workshops – alongside outstanding talent from around the world. An undeniable highlight of the cultural calendar, the festival also provides some priceless annual respite from the bleakness of a Scottish January. The 2018 lineup is no different, promising more than 2000 artists involved in 300 events across 20 venues. As with every year there will be no shortage of magical moments and precious memories for the thousands of people lucky enough to be in the audiences. For me, though, the highlights of this year’s festival offer a very special opportunity: the chance to once again experience the work of two of my favourite musicians, John Martyn and Martyn Bennett. Despite being born in England and Canada respectively, both men were brought up in Scotland and have come to be closely associated with how we think about modern Scottish music. John Martyn was a mesmerising singer-songwriter and guitarist whose career spanned five decades via more than twenty studio albums. His incredible, near-inhuman voice – often more like a saxophone than traditional vocals – rolled inexorably through line after line of his songs, while the dazzling variety of styles and techniques at his fingertips allowed him to perform with extraordinary range. In songs like Over the Hill or One for the Road his vocals kick and bounce joyously over folk-styled fingerpicking; when performing I’d Rather Be the Devil he shifts to a bluesy, guttural roar; in Hurt in Your Heart or Fine Lines he seems able to distil his emotions into their purest form via haunting, languorous melodies. But no matter the style, the context, or the scope of his experimentation, one thing stayed the same: he always sounded like John Martyn. Martyn Bennet was a piper, pianist, violin player and composer best known for creating ‘Celtic fusion’. He blended the sounds and styles of traditional music with the beats and technology of the 21st Century and in doing so created a magical representation of Scotland in musical form, reflecting – and celebrating – everything from isolated Highland glens to Central Station at rush hour, from the stories of our past to the people of the present. The great achievement of his alchemy is in capturing so much of how this dreich and pleasant land looks and thinks, acts and reacts. In short, he created music which sounds the way contemporary Scotland feels and although he insisted that he wasn’t trying to “change the face of Scottish music” (“It’ll change on its own,” he said, “in ways I don’t even know how”) there is no doubting the enormous influence he continues to exert. Both men had a huge impact on the musical world, but John Martyn and Martyn Bennett have also provided much of the soundtrack to my adult life. Some of my strongest memories – good and bad – are bound up with the beautiful music they created. Many years ago, when my girlfriend and I nearly split up during a holiday in Helmsdale, I sat by the water – drunk and getting drunker – late into the night. As the colour drained away from the sky over the north sea, I listened to John Martyn’s Small Hours – an introspective, echoplexed masterpiece played to the rhythm of an audible heartbeat – on repeat through my headphones. I don’t know how many times the song played, but I remember that it made me feel a little bit less alone. Several summers later, when that same girlfriend and I stood in the middle of Glasgow’s Old Fruitmarket, surrounded by family and friends on our wedding day, it was Couldn’t Love You More – performed by two of our closest friends – that played for our first dance. As for Martyn Bennett, listening to one of his albums might bring back memories of watching the sunset over the Paps of Jura from the garden of a holiday house near Tayinloan, or riding my motorcycle through Ardnamurchan in the middle of an almighty thunderstorm. One song in particular – Why – reminds me of sitting on a black-sand beach in La Gomera, watching the sun sink into the Atlantic, and wishing my wife and son were sitting next to me. Since then we have had only their music and the memories that come with them – but now, thanks to the amazing dedication of two groups of musicians, and the magic of Celtic Connections, something extraordinary is about to happen. On Tuesday night, John Martyn’s most famous album, Solid Air, will be performed from ‘start to end’ by a band featuring some of Scotland’s top gigging musicians. They have previously completed similar performances of legendary albums such as Rumours by Fleetwood Mac and Daft Punk’s Discovery. Originally slated for the small venue Hug and Pint, the gig was soon moved a mile along Great Western Road to the Oran Mor in an attempt to accommodate the surprise demand. When it sold out again, a 6pm matinee show was arranged. A few nights after Solid Air is revived, one of the most anticipated events of this year’s festival takes place when the GRIT orchestra reforms to take over the Hydro. Back in 2015, violinist and composer Greg Lawson brought together dozens of musicians from Scotland and beyond (as well as the actor David Hayman) for a spectacular live version of Martyn Bennett’s final album, Grit, in Glasgow’s Royal Concern Hall. That stunning performance not only opened the festival, it also marked ten years since Bennett’s death. Three years on, the GRIT orchestra will come together once more for a live performance of Bennett’s second album, Bothy Culture. Billed as a “music-vision-dance-bike spectacular”, Bothy Culture & Beyond… will feature a number of special guests including Danny MacAskill, the Scottish cyclist whose hit video The Ridge – which has been viewed more than 55m times on YouTube – brought Martyn Bennett’s music to a whole new audience. When asked why he chose to perform that particular album, Lawson told me: “Grit celebrated the vocal traditions in Scottish music whereas Bothy Culture is about the melodic and dance traditions. What is also abundantly clear is that Lawson sees this as just the beginning of a larger journey. The GRIT orchestra exists not just to celebrate culture but also to play a part in building it. Lawson talks passionately about the breaking down of musical barriers and hierarchies in a way that makes it all feel very much like a continuation of Martyn Bennett’s own work: “An orchestra has become something that represents an institution and an industry. This orchestra represents people. It’s about musicians being allowed to be musicians. Being allowed to play their hearts out.” It is a project of which Bennett – and, I suspect, John Martyn – would surely have approved. And so, at two completely different venues, and in two entirely different ways, John Martyn and Martyn Bennett will each be brought back to life through celebrations of their ground-breaking musical achievements. It’s an incredible gift for fans like me, as well as a unique opportunity to bring their extraordinary work to new audiences. Most importantly, it is also the best possible tribute to two true giants of modern Scottish culture. And maybe, just maybe, it can be the start of something new, and wonderful, and Scottish. 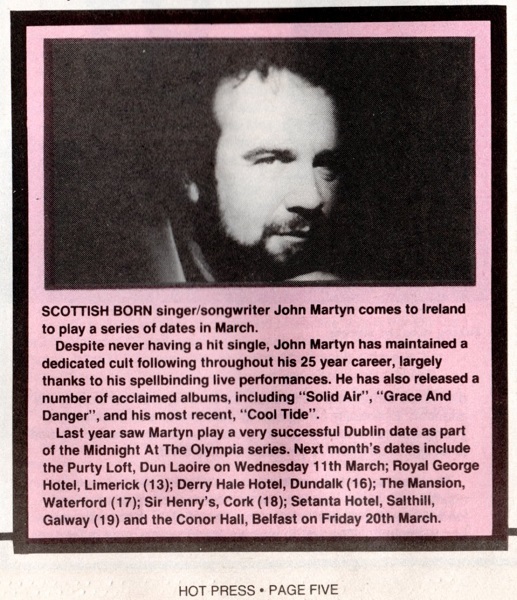 SCOTTISH BORN singer songwriter John Martyn comes to Ireland to play a series of dates in March. Despite never having a hit single, John Martyn has maintained a dedicated cult following throughout his 25 year career, largely thanks to his spellbinding live performances. He has also released a number of acclaimed albums, including “Solid Air”, “Grace And Danger”, and his most recent. “Cool Tide”. Last year saw Martyn play a very successful Dublin date as part of the Midnight At The Olympia series. Next month’s dates include the Purty Loft, Dun Laoire on Wednesday 11th March; Royal George Hotel, Limerick (13); Derry Hale Hotel, Dundalk (16); The Mansion. Waterford (17); Sir Henry’s, Cork (18); Setanta Hotel, Salthill. Galway (19) and the Conor Hall. Belfast on Friday 20th March.